A father and daughter team open a new family-friendly pizza joint in Fairhope. They say you should pick a business partner that you really like. For the duo who recently opened Section Street Pizza in downtown Fairhope, it’s more familial than that. After a lifetime of hearing her dad, Mark Foster, reminisce about the glory days at his first job at a pizza joint, Elizabeth Pieczynski finally got a wild hair and thought a pizza business with her dad would be a blast. 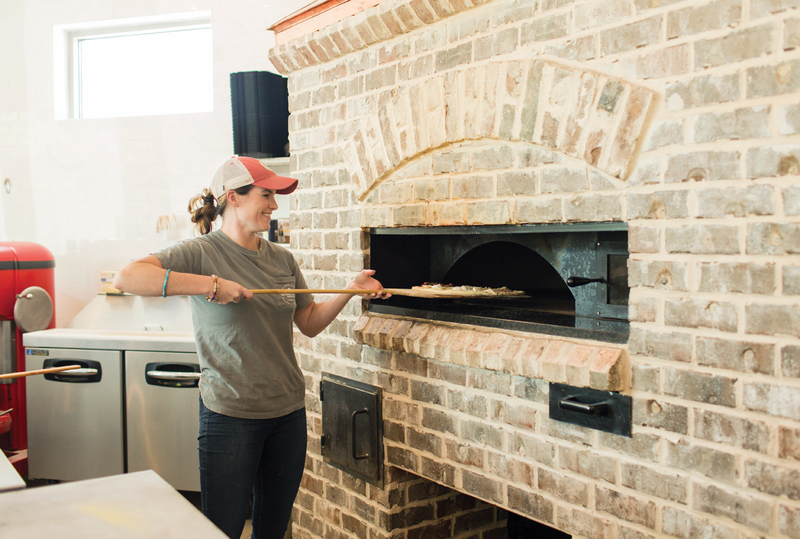 They jumped into the deep end this summer and opened their first restaurant — a bright and airy corner pizzeria with a looming brick oven and a family-friendly atmosphere. Because the retail development, located across from the Fairhope Civic Center, was just under construction, Elizabeth got to design the space from top to bottom, a job she calls “a complete heart attack.” Thank goodness for Pinterest and lots of pizza parlor research, which kept Elizabeth focused on the look she was after. With a young daughter at home, Elizabeth was acutely aware of the lack of dinner spots where a family with kids would feel welcome. She wanted Section Street to be a family’s go-to dinner spot. To that end, she designed the Four Corners Pizza, which allows each member of the family to pick their own toppings, customizing their very own slice of heaven. Something as simple as that makes peace on the home front a real possibility. In addition to being family-friendly, Elizabeth also wanted the pizzeria to be a welcome space for people with special needs to dine — and, more importantly, to work. Inspired by her mom’s career, she and her dad decided to make it a safe place where employees can be comfortable in their uniqueness. “It’s a small restaurant, and our staff is a tight-knit group. I talk to their moms, and they have job coaches. The goal was to integrate that into the business model from the start,” Elizabeth explains humbly, emphasizing that neither she nor her employees seek attention for the hard work they are doing. And hard work it is, owning a restaurant. Elizabeth perfected the pizza dough recipe over months and months of trial and error, and it takes 4 hours to produce (make that three days and 4 hours when you add in the proofing time!). It takes serious preparation, but Elizabeth and Mark can be found mixing the dough together daily. “I’m proud that we don’t take shortcuts,” Elizabeth says. “We love finding ingredients that might be temperamental, like fresh basil and arugula, but that add so much to the flavor of the pizza. Our pepperoni has no preservatives, and the prosciutto is the same. We don’t slack on ingredients.” This classic pizza joint also offers modern choices like gluten-free crusts, vegan cheese and only the freshest vegetables. 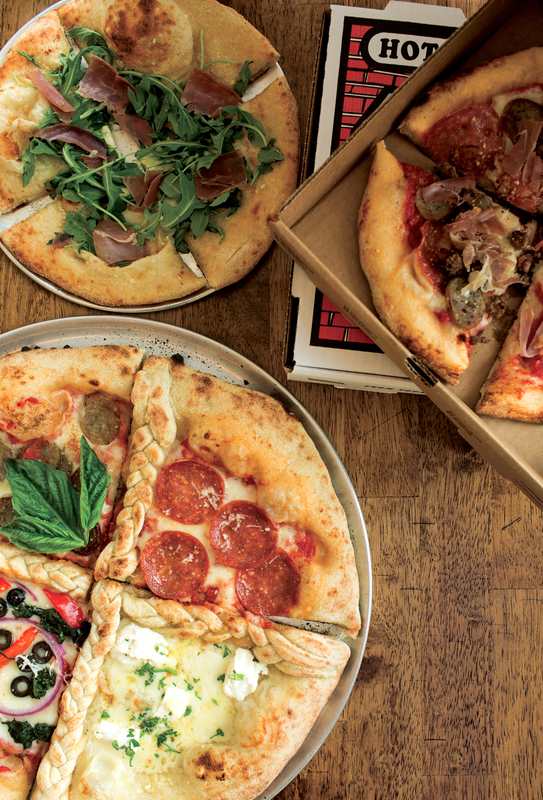 Old meets new at this multigenerational joint where there’s a whole lot of love put into your pizza pie. 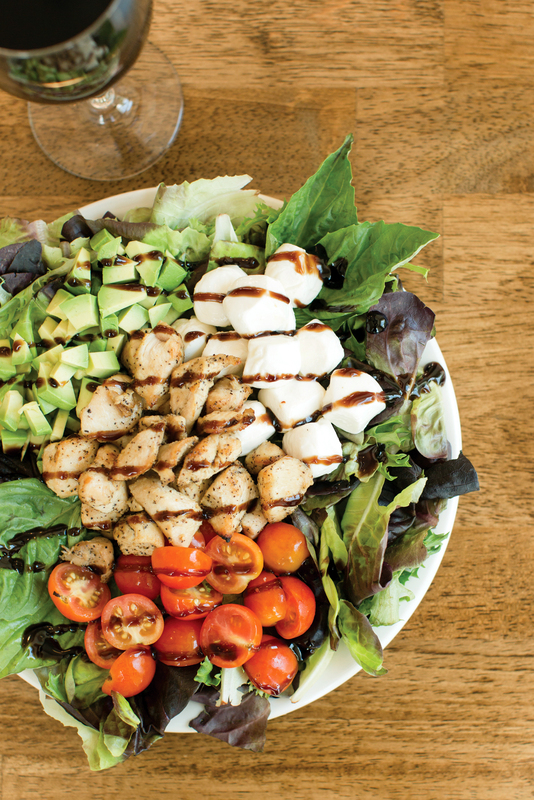 Warm bites of perfectly grilled chicken, tiny mozzarella balls, diced avocado, cherry tomatoes, mixed baby greens and fresh basil are arranged like a Cobb salad and drizzled with balsamic reduction. Meat lovers to the max! This popular pie at Section Street has fresh mozzarella, homemade tomato sauce and five different meats: Italian sausage, ground beef, prosciutto, bacon and pepperoni. This sophisticated pie has fresh mozzarella, crushed garlic, Parmesan and Romano cheeses, salty prosciutto di Parma and a drizzle of decadent truffle oil. Then it’s topped with fresh baby arugula for a crisp and peppery contrast. The only way to have peace at dinnertime — A braid of handmade dough divides a tomato and mozzarella pie into quadrants. Then choose the toppings you want on each section to make everyone in the family happy.